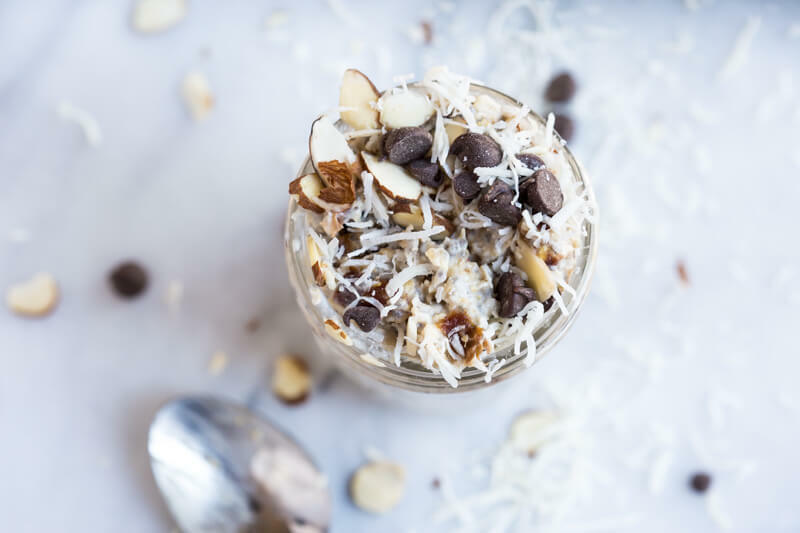 Almond Joy Overnight Oats recipe made with coconut water…. say what??!! Yep, healthy vegan overnight oats recipe for breakfast. 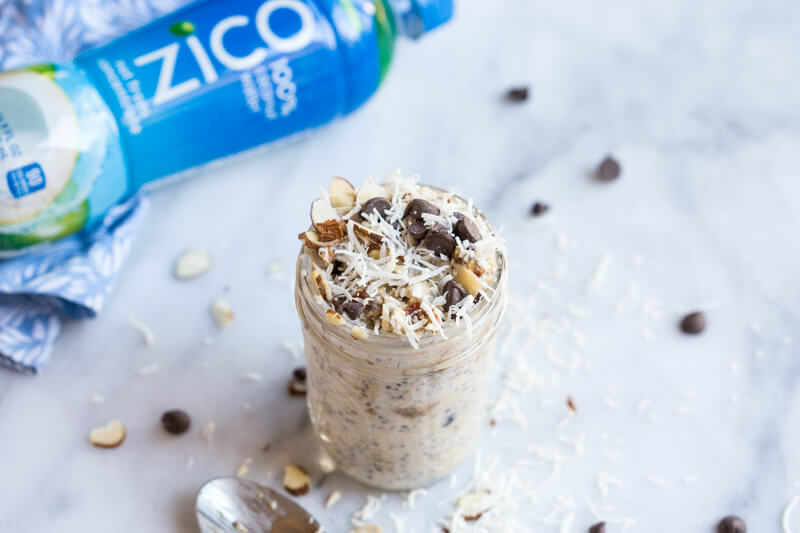 This Almond Joy Overnight Oats recipe is sponsored by ZICO Coconut Water. You may be asking yourself, what are overnight oats? 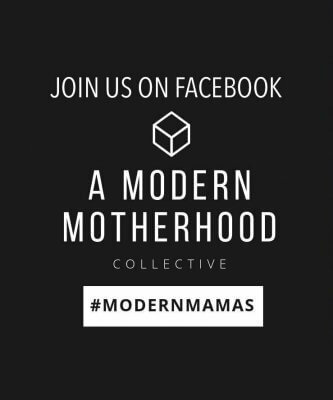 Well I’m so excited you are here to learn all about vegan overnight oats, how to make overnight oats, how long overnight oats last, if you can eat overnight oats cold. 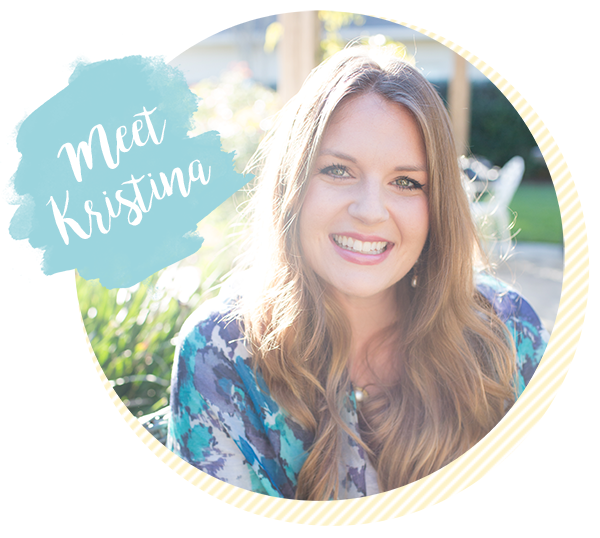 Ya’ll I’m answer all the questions about overnight oats AND sharing with you THE BEST OVERNIGHT OATS RECIPE made with coconut water. So this one basically tastes like you’re eating an almond joy candy. And get excited, this overnight oatmeal recipe is healthy. Who has a sweet tooth??? My hands are raised up high. If you’re anything like me and can eat dessert any time of day. Girl, you are in for a T-R-E-A-T! 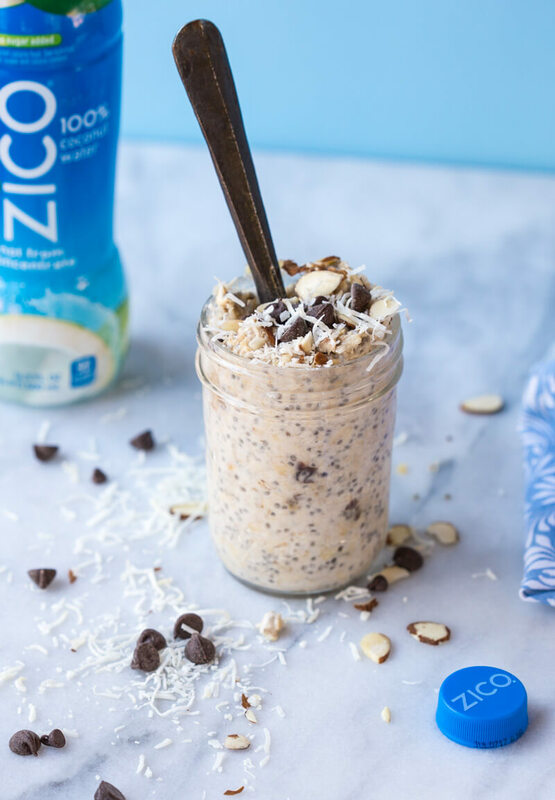 You are going to be singing “oooooh happy dayyyyy” after you try this recipe for Almond Joy Overnight Oats recipe. Like how can something so simple and NUTRITIOUS be so daaaaaang delicious?! Yes, we are talking healthy vegan dessert here…AT BREAKFAST TIME!!! How to make overnight oats. Grab a mason jar and fill it with old fashioned oats! Pour in something creamy. like coconut cream, yogurt, cottage cheese, or even silken tofu! Add liquid: milk, coconut milk, almond milk, coconut water. Place the lid on the mason jar and give it a shake. 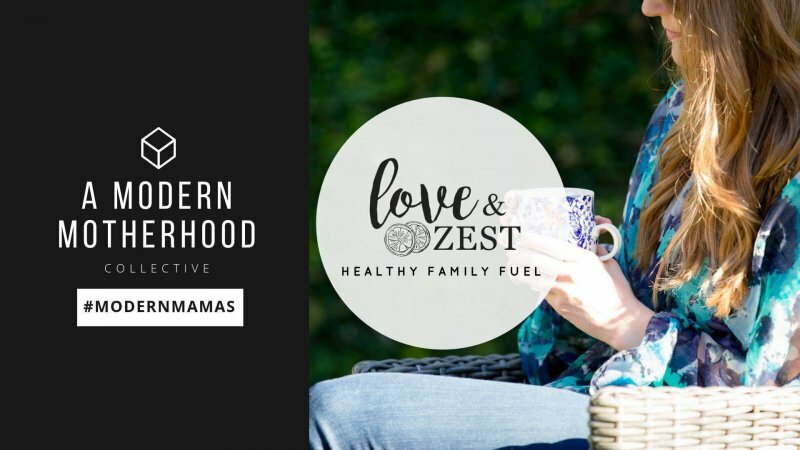 Overnight oats are one of my favorite go to healthy breakfast recipes because they are the answer between eating breakfast vs running out the door without any fuel #momlife, right? They are so dang convenient. For reals. We all know that breakfast is the most important meal of the day, so why not eat dairy free overnight oats for breakfast. Oats are high in beta-gluan, soluble fiber that tells the liver to pull LDL “bad” cholesterol out of the blood. Umm… more of action please. Yep, I’ll take this Almond Joy Overnight Oats recipe, thank you very much. It’s recommended that we eat 25-30 grams of fiber every day for health and men need even more with a recommendation of 48 grams a day! One serving of oats provides 4 grams of fiber and this recipe is packed with 10 grams of fiber and 8 grams of protein. How long do overnight oats last? It depends on what mix ins you add to your oats, but for this recipe I find that it keeps up to 5 days in the fridge in an airtight container/mason jar. Do you have to eat overnight oats cold? Nope. I personally like these almond joy over night oats chilled right out of the fridge but you don’t have to eat them cold. In fact, warm them up for 20 seconds in the microwave if you prefer a warm bowl of oats, and then add your toppings. Can you use steel cut oats for overnight oats? Good news! YES!! It gives a chewier texture which I really like. If you’re interested in trying steel cut overnight oatmeal, give this recipe for High Protein Chocolate Banana Overnight Oats. How to make vegan overnight oats? If you’re new to vegan overnight oats, this breakfast will rock your socks off. If you’ve tried overnight oats in the past and just weren’t impressed I’m BEGGING you to give it another shot. 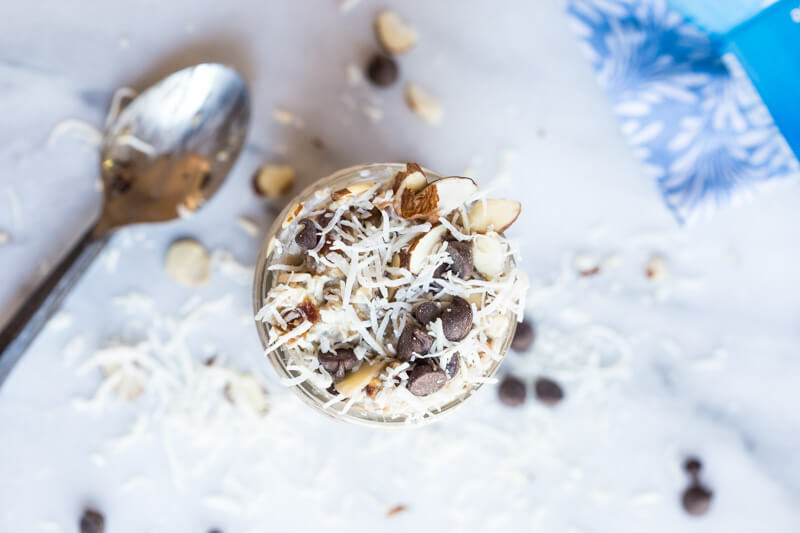 The difference maker in this one is it’s a dairy free overnight oats recipe (well, minus the chocolate but who’s really counting??). Of course, you can always opt for vegan chocolate chips if you want this to be 100% dairy free and vegan. If you’re not an overnight oats with almond milk or yogurt type of person, did you know you can make overnight oats with water? But not just any water– coconut water! 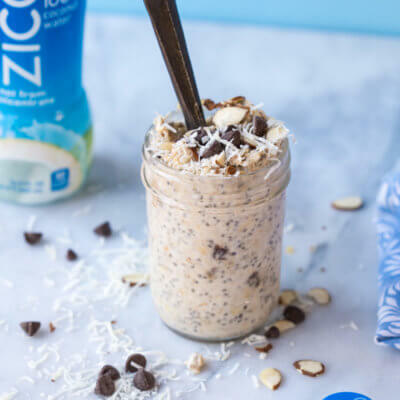 Now, I love adding cottage cheese and peanut butter and coffee and espresso to overnight oats….BUT this one is made with COCONUT WATER! Hello gorgeous jar of Almond Joy Overnight Oats, I’m looking at you. Coconut water gives the perfect essence to these vegan overnight oats. High five, ZICO. 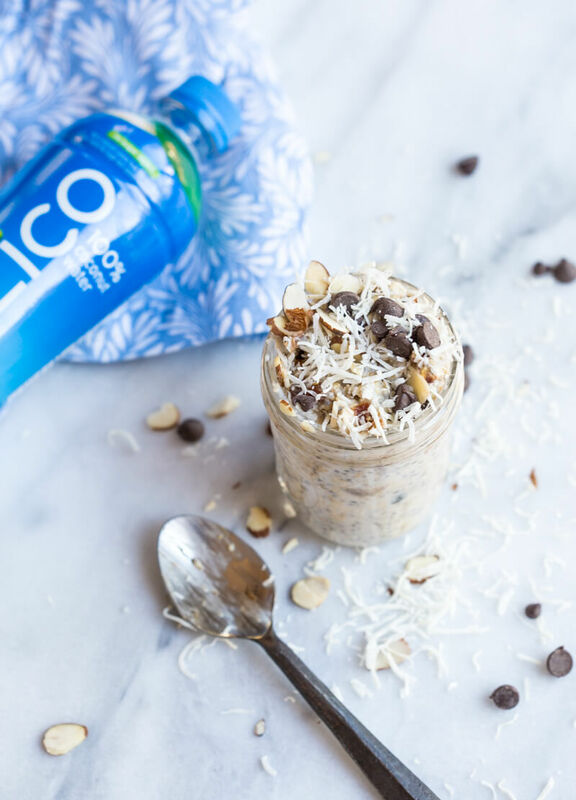 Oh, and not all coconut water is created equal, which is why you I use ZICO Coconut Water in my recipes, because it’s 100% coconut water, no sugar added. ZICO Natural Coconut Water is only one ingredient…. COCONUT WATER, nothing more, nothing less. Pure coconut water just the way nature intended. When it comes to food #InsideIsEverything that matters, because you are what you eat, right? I also added in a dollop of coconut cream for some creaminess that’s freaking irresistible. The chopped date practically melts overnight into the oats and sweetens it up… remember it’s dessert like + chia seeds and raw oats so it’s all healthy and stuff. You guys. Don’t wait. 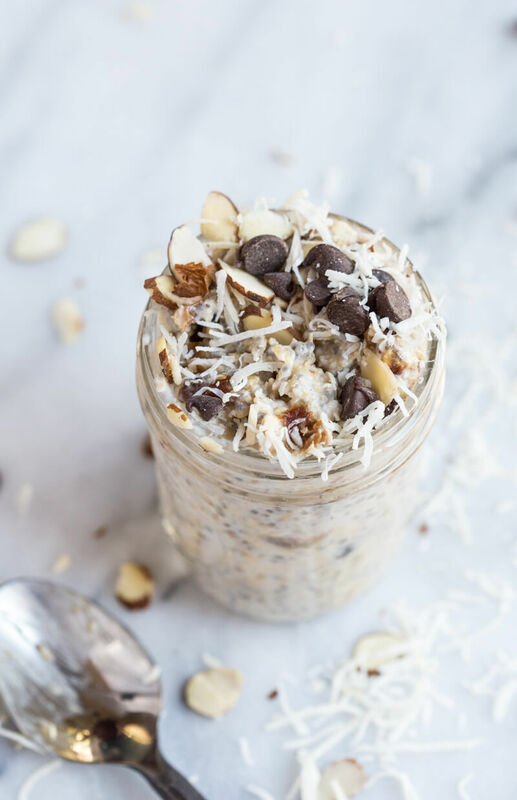 Go, no RUN to the kitchen to make this almond joy overnight oats recipe right now because your breakfast longs for something pretty epic. And to you my friend, you should probably go ahead and make a double batch of this vegan overnight oats recipe to have some for tomorrow…errrr for dessert after lunch. NEED MORE OVERNIGHT OATMEAL RECIPES?? In a mason jar, add oats, chia seeds, date, almond extract, coconut cream, and coconut water. Tighten the lid on the mason jar and give it a shake. In the morning, top with chocolate chips, almonds, and coconut flakes. Note: Vegan overnight oats can be enjoyed chilled right out of the fridge or if you prefer a warm bowl of oats, heat in the microwave for about 20 seconds. This looks amazing!!! Do you think it would be possible to replace the dates with stevia or another sweetener? thanks!! you could totally do that although dates do give a “caramel” flavor– maybe try maple syrup? Alternatively, if you’re looking for sugar free you could do stevia. I’ve never tried overnight oats, I have to confess to being hooked on good old fashioned porridge 😉 This looks good though. What is coconut cream? Something you make? where do you get coconut cream from ? I get mine from Trader Joes. You can also put a can of coconut milk in the fridge and the coconut cream will float to the top. My daughter is coming home in a week, I will have to make this for her, she would love it. This looks incredible! I’m definitely taking you up on your suggestion to just make a double batch! I’m so old-school with oatmeal and haven’t tried overnight oats yet – your candy bar inspired version is so tempting! Almond joys are one of my favorite candy bars, so eating this flavor for breakfast brings me tremendous excitement! I love the fact that their coconut water in here, the more coconut flavor the better! AGREE!! Bring on the coconut. Look at those toppings! I am drooling over here. Love overnight oats, this looks to good not to try! Wow. This sounds amazing – love the combo of coconut water and coconut cream. Can’t wait to try! These overnight oats are right up my alley! Yum! 🙂 Glad to hear it. ahhhh I love this breakfast idea! I love the almond joy flavor combo. Dessert for breakfast! Overnight oats are one of my favourite breakfasts. It’s so nice to wake up and have breakfast already made for you. Thanks! It’s one that we have on repeat. I make overnight oats for breakfast (and snacks!) all the time but not once have I ever thought of using coconut water. Definitely going to be giving this a try ASAP! Hope you do!! It’s pretty life changing. That looks so good That I’m sure it would do just fine for a healthy dessert! YES! My hubs calls this dessert, I call it breakfast. Robert– nutrition analysis has been added to this recipe 🙂 Enjoy! Always a fan of overnight oats. Love it that you used coconut water in it! That definitely must bring in a different dimension of flavor to it. Thank you and yes it does!! And those dates….